Components of the peripheral nervous system. The peripheral nervous system is composed of neurons and neuronal processes found outside the central nervous system (encephalon and spinal cord), as well as of glial cells, both Schwann glial cells that wrap the axons and peripheral glia located in the neuronal ganglia. 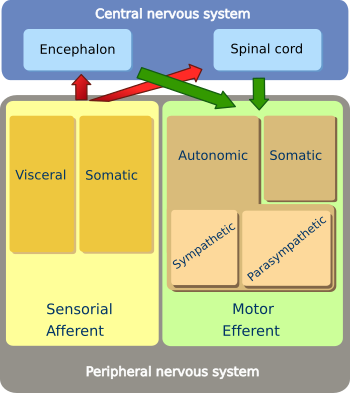 The main role of the peripheral nervous system is to convey the input information, or stimuli, that the body is able to sense (external, internal and proprioceptive inputs) to the central nervous system, and in turn, carries the commands of the central nervous system to the different organs and parts of the body. From a functional point of view, the peripheral nervous system can be divided in a somatic part and an autonomic part. The somatic part is related to the control of voluntary movements of skeletal striated muscle, whereas the autonomic part is related to the involuntary movement of internal organs through smooth muscles. Nerves are axon bundles plus connective tissue. Axons are also known as nerve fibers. Axons are wrapped by Schwann cell expansions and connective tissue. A myelinic fiber is an axon wrapped with several layers of one Shwann cell, whereas when a Schwann cell surrounds several axons at the same time, those axons are referred as amylinic (they usually show small diameters). Myelinic fibers are the most frequent in the peripheral nervous system. Each nerve fiber, either myelinic and amyelinic, are surrounded by a thin layer of connective tissue known as endoneurium. Several nerve fibers, plus their endoneurium, associate to form small fascicles surrounded by connective tissue referred as perineurium. A third layer of connective tissue, the epineurium, wraps and gathers the fascicles to form a nerve. There are two types of nerves: cranial and spinal nerves. Cranial nerves are those that leave or enter the encephalon, whereas the spinal nerves leave or enter the spinal cord. In addition, those nerves that send information from the central nervous system to the rest of the body are known as efferent or motor nerves, whereas those that bring information from the body to the central nervous system are known as afferent nerves o sensory nerves. Cranial nerves can be only efferent, only afferent, or mixed (having afferent and efferent components). Twelve pairs of cranial nerves have been described and numbered by using roman numerals: I to XII. The olfactory (I) and the optic (II) nerves are not regarded as "normal" cranial nerves. Therefore, there are ten cranial nerves left: III to XII (see page ). There are 31 pairs of spinal nerves. They are grouped according to the level of the spinal cord where they are located: 8 pairs in the cervical region, 12 pairs in the thoracic region, 5 in the lumbar region, 5 in the sacral region, and 1 pair in the coccygeal region (see page ). All spinal nerves are mixed nerves, i.e. they have motor and sensory components, excepting the first nerve, which is only motor. The mixed spinal nerves are composed of sensory nerve fibers which enter the spinal cord dorsally, forming the dorsal root, and of motor nerve fibers coming from the ventral roots of the spinal cord. Both, dorsal and ventral roots are divided in 6 to 8 little roots when entering or leaving the surface of the spinal cord. Spinal dorsal roots are made up of sensory afferent nerve fibers that come from a close nerve ganglia known as spinal ganglia or dorsal root ganglia (see image below). These fibers may make synaptic contacts with interneurons in the spinal cord or cross to the white matter to become part of the ascending or descending tracts. The sensory information entering through the dorsal roots can be somatic (from receptors located superfically in the skin, deeper in the joints and in the muscles) or visceral (from receptors located in the visceral organs and blood vessels).. The nerve fibers of the ventral roots directly innervate the skeletal muscle for voluntary movements, and also innervate both sympathetic and parasympathetic peripheral ganglia of the autonomic nervous system, which in turn innervate smooth and cardiac muscles to produce involuntary movements. 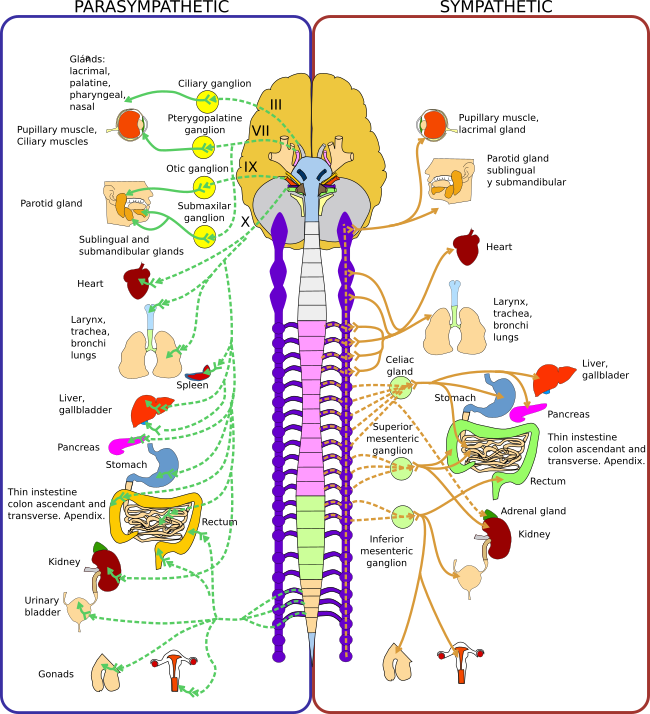 As mentioned above, the cell somata of the neurons of the afferent fibers are located in the spinal ganglia. However, the cell somata of the neurons that send axons through the ventral roots are located in the spinal cord gray matter. Ganglia are structures located outside the central nervous system. They contain neuronal cell bodies that give rise to nerve fibers that form the peripheral nerves. The cell bodies of the ganglionar neurons are usually very large and are surrounded by other small cells known as satellite cells, which are a type of peripheral glia. The larger ganglionar cell bodies (80 %) have cellular processes that carry tactile and proprioceptive information, being the conduction speed of this information fast, whereas the smaller ganglionar cell bodies (20 %) bear nerve fibers that transmit information about temperature and pain. In the sensory ganglia, no synapses is formed. These ganglia are made up of sensory ganglionar neurons bearing a bifurcated cellular process, so they are pseudomonopolar neurons. One of the branches runs to the periphery where it branches more times. These final branches end as free terminals or make contact with receptors of the skin, muscles, joints or visceral organs. Through these endings, they get sensory information. Although this branch looks like an axon (even it has myelin sheet), it functions as a dendrite. The other branch is the real axon that enters the spinal cord or the encephalon. Spinal sensory ganglia are located in the dorsal roots, whereas the cranial sensory ganglia are found in the cranial nerve pairs V, VII, IX and X.
Autonomic ganglia are part of the autonomic nervous system. They are made up of neuronal bodies of motoneurons that mostly innervate the smooth muscles of the visceral organs. The neuronal bodies are synaptically contacted by neurons located at the spinal cord known as preganglionar neurons, so autonomic ganglia are stations for information relay. Autonomic ganglia are classified as sympathetic and parasympathetic ganglia. Sympathetic autonomic ganglia are usually located forming a cord, also known as paravertebral cord, running parallel to the vertebral column, whereas parasympathetic autonomic ganglia are mostly located close to the organ that they are going to innervate, excepting the parasympathetic ganglia in the head and neck. As mentioned above, most of the sympathetic ganglia form paravertebral ganglia, which are connected between each other as a cord. There is one paravertebral ganglia cord at each side of the vertebral column, parallel to the spinal ganglia. Some axons from the paravertebral ganglia enter in the spinal nerve through the gray ramus communicans (non myelinated fibers) and innervate smooth muscle of the blood vessels, sweat glands, seborrheic glands and hair follicles. Another axons of the paravertebral ganglia go straight to innervate smooth muscle of visceral organs, constituting the visceral nerves. There are another ganglia, known as perivascular sympathetic ganglia, located close to the large blood vessels. The parasympathetic ganglia are the four pairs of parasympathetic cephalic ganglia plus numerous ganglia located close to or into the visceral organs, that can be yuxta- or intramural parasympathetic ganglia. Intramural parasympathetic neurons do not form a typical ganglion, they are scattered in small groups inside the visceral organ. Components of the peripheral nervous system. Not all the organs and body structures innervated are depicted. Dashed lines indicate the presynaptic elements and solid lines the postsynaptic ones. Yuxta- and intramural ganglia are not distinguished.